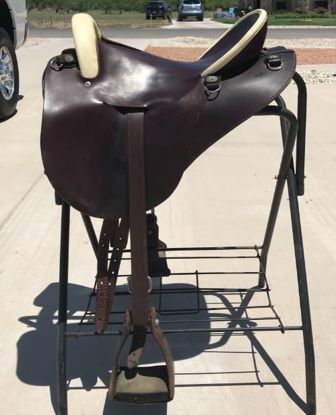 If you would like to list your own saddle for sale here, you can use the 'Post Your Saddle Here' link below to "purchase" the advertising. I get hundreds of hits a day, am well cataloged by search engines, and have had great success helping many saddles be sold. Saddle posting stays until you tell me the saddle is sold, so no time limit! Please send the description of your saddle in the box below. Photos (up to 4) can be emailed or texted to either lisa@mossrockendurance.com or 719-439-2472. Saddle ad description tips . . . should include tree width, seat size, general description, age, why you are selling, if you are covering shipping costs, your contact information for questions and what forms of payment you will accept. (Just FYI, if you sign up for a PayPal account or have a PayPal account, you can invoice the buyer and they can pay via debit/credit card or their PayPal account.) I will post the ad to the server and may have some additional questions for you. Sommer Evolution LaVita, NEW LISTING! 18.5" Sommer Evolution LaVita on a 31.5cm wide tree. Beautiful upgraded Yuchton leather, wool flocked. Very wide gullet channel, comfortable padded seat. Also has removable knee blocks that aren't on the saddle in the pics. Tree can be adjusted to fit your horse by any saddle fitter with a saddle press. I am selling only because I am a tall rider ( 6' 4") and the flaps are not forward enough to accommodate me. This Sommer is in demo condition. ASKING $2800 or best offer. Seller willing to cover shipping with full price offer. Retails new $3400. Will accept PayPal. CONTACT : Call or text to 517-605-7167. Stonewall w/Living Bar, NEW LISTING! DeSoto Endurance Saddle, NEW LISTING! This saddle was built June 2011, lightly ridden and well cared for. It has a size 16" seat and was made for a 5` 1" person. The fenders can lengthen to accommodate up to 5` 4". It is a beautifully made saddle with Black English leather seat and Havana brown skirt and fenders. Adjustable ring rigging with billet to pull up and buckle on each side. It has all brass hardware, 2 lovely conchos and comes with EZ Ride Stirrups. This saddle is 7 in. wide in the gullet and the bars have extra dish for a horse that has more dish behind the withers than normal. Will fit a medium wide or slightly wider than medium withered horse with an A frame shape but developed top line (not a flat back). The flare at the front of the bars makes this an especially comfortable saddle for the horse with any kind of gait; you can sit in this saddle all day! Please check out the standard features for a Desoto Saddle - there are too many to list! : http://www.desotosaddles.com/standard.shtml. 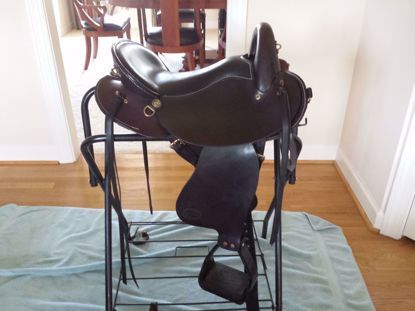 Sadly, I am selling this saddle because my horse passed away; it does not fit the new horse. Asking $1300. Buyer pays shipping charges. CONTACT: Please contact Jackie at thurstonjs@gmail.com. Specialized Custom Saddle, NEW LISTING! Custom Specialized Saddle, 15" seat, wide to extra- wide tree, good condition. I am selling this saddle because I need more seat security with a horn and suede seat. Items included are a contoured, wool pad, 26" girth, crupper, extra pads and shims. Pads and shims pretty well used, may want to consider purchasing new pads and shims. I have owned this saddle since 2012. 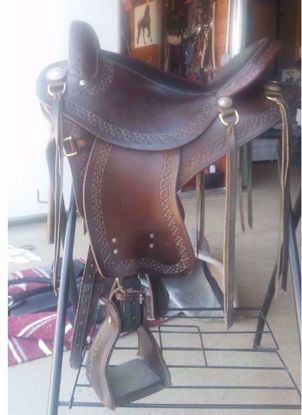 I purchased this saddle new with all the customizing, tooling, leather stirrups, conchos, etc. I am 5'2" with a 31" inseam. Stirrups still have a fair amount of adjustment. I've done some minor repair on the leather stirrups and the pad has required some edge repair. The pad has been washed many times, but has many more miles in it. On the left side of saddle, under skirt, rubs caused by fender construction, I had the company add leather to underside of fender to prevent further rubbing. My name is Sherry Eckel, phone 303.807.0040, I live in AZ. I will ship this saddle for $50.00. I'll return any shipping $ I don't use. I will accept Paypal for payment. My email: sherryandross@gmail.com. This is a great saddle, I just need a more secure seat now at age 67.